Keep your Camping Food from Getting Soggy with the Cooler Tray! Bryan stopped by and showed us how the Cooler Tray can keep our food from getting soggy while camping. When you’re camping, you want to keep all your food cool overnight or over the weekend. But that doesn’t have to mean soggy buns, soggy grapes, soaking-wet beverage cans that have gunk on them – ick!! This is an easy & economical solution to that summer problem. What a cool invention! You can get yours in the Sporting Goods department of Smith & Edwards as well as right here in our online Camping Coolers section.. 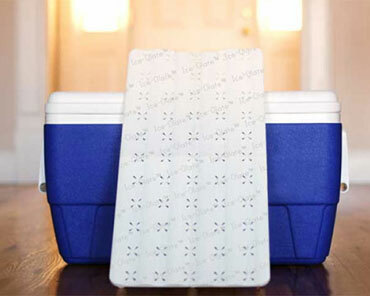 The Ice-Olate Cooler Tray is designed to adjust to fit practically any size coolers: from 45 up to 100 quart ice chests & coolers, by Igloo, Yeti, Coleman, and just about any other brand. It holds up to 80 pounds of food & drinks. Thanks for coming by, Bryan!